Clark University juniors Navid Al Hossain ’18 and Michael Gaiewski ’18 spent the summer delving into the mathematical modeling of gene expression, the process through which genetic information in DNA drives the synthesis of protein products. They worked in the laboratory of Jacqueline Dresch, an assistant professor in the Department of Mathematics and Computer Science. Jacqueline Dresch on his research project. Hossain, a mathematics and computer science major from Bangladesh, and Gaiewski, a mathematics and economics major from Mystic, Connecticut, joined 13 other science majors who won stipends through Clark’s Interdisciplinary Summer Research Program. The stipend allowed them to live on campus, conduct research in faculty labs and network with fellow scientists. 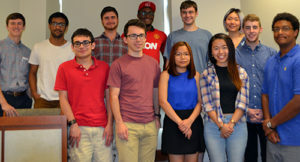 Students who made five-minute elevator pitches included, front, from left: Michael Gaiewski, Jiri Roznovjak, Tran Tran, Siu Ting Lam and Amiel Jaggernauth; back, from left: Jordan Majka, Navid Al Hossain, Yoni Hazan, Precious Oyem, David Berry, Siqi (Gillian) Yuan and Justin Wilbur. 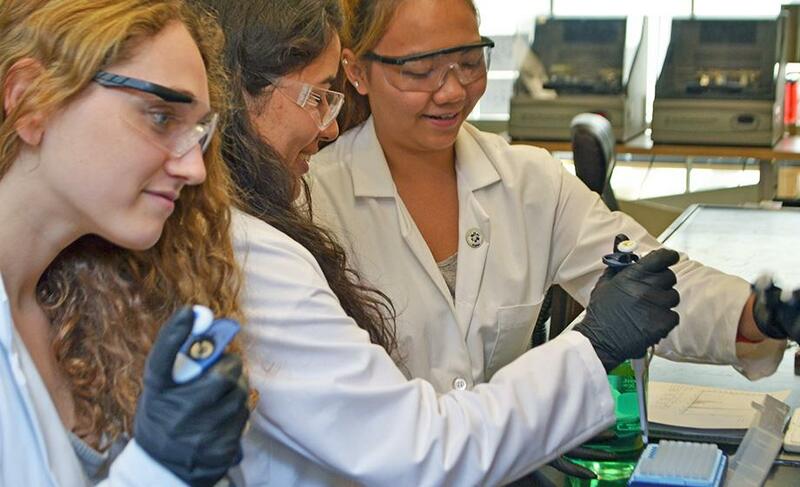 The program paired students with faculty mentors in biology, chemistry, biochemistry and molecular biology, physics, computer science and mathematics. The experience ties into Clark’s LEEP (Liberal Education and Effective Practice Program), which provides undergraduates with opportunities to apply their academic knowledge and gain career experience. Biology senior Emile Ogisu ’17 of Japan and biochemistry and molecular biology seniors Lara Prosterman ’17 of San Francisco and Pinky Htun ’17 of Myanmar spent June and July isolating, purifying and studying proteins using state-of-the-art lab equipment, including a high-speed centrifuge and a nuclear magnetic resonance spectrometer. They worked in the lab of Donald Spratt, assistant professor of chemistry and biochemistry and Carl J. and Anna Carlson Endowed Chair in Chemistry. “Once you understand a protein’s mechanism, you can design better drugs, which can be used in future cancer treatments because most of the proteins we study in the Spratt Lab are involved in various human diseases,” Ogisu explains. Meanwhile, Jiri Roznovjak ’18, a computer science and math junior from the Czech Republic, teamed with Boston University scientists to develop algorithms that generate and organize images, research that could be applied to artificial intelligence. 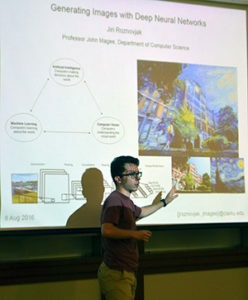 His summer experience resulted from a cross-institutional partnership forged by Assistant Professor John Magee of Mathematics and Computer Science. 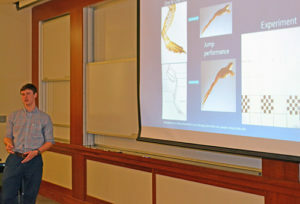 Throughout the summer, the students attended weekly seminars and professional development workshops and presented their findings to faculty and peers. Jordan Majka ’18, a biochemistry and molecular biology major, talks about his research on the form and function of frogs’ jumping. He worked in the Evolutionary Functional Morphology Laboratory of Philip Bergmann, assistant professor of biology. To lead off the summer series, Budwig asked the faculty mentors to give five-minute, one-slide PowerPoint presentations on their deeply complex research. “This was a daunting challenge, actually, trying to get this down to five minutes,” Justin Thackeray, associate professor and chair of biology, told the audience of undergraduates, graduate students, post-doctoral researchers and faculty. In his presentation, Thackeray started with the basics of cell development, describing the “large set of interconnected signaling pathways, so cells can know what they’re supposed to become, whether they’re supposed to be growing, whether they’re supposed to be dividing, whether they’re supposed to still be around.” When this system goes awry and cells misbehave, that could result, for example, in tumors. 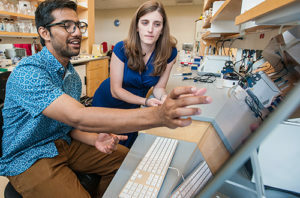 In particular, Thackeray studies the veins of fruit flies – representative of cells’ signaling pathways – to better understand the role of protein molecules in passing information on to the cellular system. With 30 seconds left, he quickly explained how his lab is working on research that could help identify drugs that would inhibit protein molecules like PLC-gamma, which can disrupt these signaling pathways and lead to diseases like cancer. Similarly, other faculty rose to the challenge: Magee discussed how his computer science research could be applied to improve the lives of people with disabilities; Spratt explained how he studies protein-protein interactions involving a protein called ubiquitin, and how his research team seeks to understand the underlying mechanisms that a family of enzymes use to control the proper attachment of ubiquitin to specific proteins in the cell, research that could be used in the future development of disease-fighting drugs; Dresch outlined how she uses mathematical tools to better understand gene expression and embryonic development; Charles Agosta, professor of physics, presented an overview of his work on superconductivity as well as renewable energy; Shuanghong (Sharon) Huo, associate professor of chemistry, summarized her lab’s computer simulations of protein folding, which underlies biological function and, in the case of misfolding, can lead to disease; and Néva Meyer, assistant professor of biology, described her research into how centralized nervous systems evolved. And then there was the slide depicting a bowl of spaghetti atop a child’s head. Denis Larochelle, associate professor of biology and program director of biochemistry and molecular biology, used that image to convey what happens when otherwise highly organized chromosomes become disordered, “like a bowl of pasta, sort of randomly spread within the nucleus.” Such disorganization can result in conditions like progeria, a rare genetic disorder that causes advanced aging. He mentioned a TED talk by Massachusetts teenager Sam Berns, who died from the disease in 2014. Jiri Roznovjak’s computer-generated image of Jonas Clark Hall, merged with a Van Gogh painting. Budwig urged the students to pick up pointers from their mentors’ presentations. Later in the summer, it was the students’ turn to give five-minute “elevator pitches” on their research. 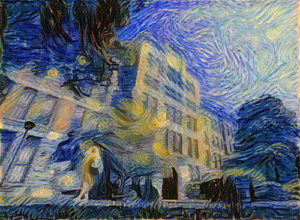 To demonstrate how to apply research in computer vision and machine learning, Roznovjak showed an image of the University’s Jonas Clark Hall, merged with a Van Gogh painting. To generate the third image, he used deep neural networks, an algorithm that learns from real-world data to, among other things, recognize the style and content of two images and ensure they are not the same. Facebook, for example, uses the same algorithm for facial recognition, and such visual application can be used for augmented reality in games and movies, as well as artificial intelligence. Roznovjak is not new to research. His research-oriented LEEP project with Magee last summer resulted in a publication, “Predictive Link Following for Accessible Web Browsing,” published in ASSETS ’15: Proceedings of the 17th International ACM SIGACCESS (Association for Computing Machinery’s Special Interest Group on Accessible Computing) Conference on Computers & Accessibility. Funding for the program goes for two more years, according to Budwig. Top photo: From left, Lara Prosterman, Emile Ogisu and Pinky Htun purify proteins in the laboratory of chemistry and biochemistry professor Donald Spratt.